A nice teriyaki stir fry recipe to try ! * Cook vegetables in simmering water until crisp-tender. Cook chicken strips in a separate pan in oil, using salt and pepper to season. When chicken is cooked, add 2 cups water, the sugar and soy sauce. Mix until sugar is dissolved. 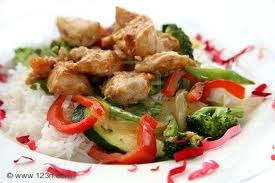 After both chicken and vegetables are cooked, drain vegetables and transfer them to the chicken and soy sauce mixture. Bring to a boil, then simmer. Take 1/2 cup water, add flour and stir until flour is dissolved. Add to the simmering chicken and vegetable mixture. Simmer and stir occasionally for 5-10 minutes. The teriyaki stir fry is readdy to serve over rice...enjoy it !